The story of how the Air Force found a fifty-cent fix for its broken $1,200+ coffee cups is one for the “you’ve got to be kidding me” section in the volumes of examples for how the U.S. government manages to waste such massive amounts of money each year. 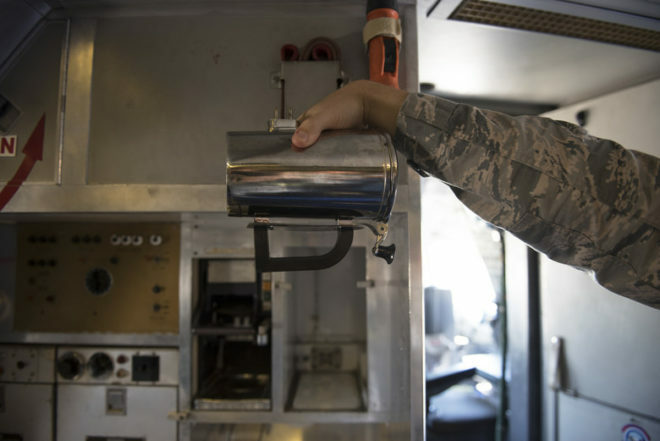 The cups, which are designed to prevent coffee from leaking when the aircraft in which they fly are actively maneuvered, have insulated metal bodies and “flip-up” lids. They are designed to plug into an electrical fixture during flight, where an internal heating element maintains the coffee’s temperature for personnel on extended flights, which can last for up to 18 hours. But then, there’s that breakable handle on the coffee cups, as can be seen in the following picture from the Air Force. Red Robin is Cutting 570 Jobs. Can You Guess Why?